There's a pivotal scene in University of Death where the muso-technology geek at the heart of the story struggles to persuade the venal record industry boss to buy-in to a groundbreaking new scheme that will change the industry forever. To accomplish this, the geek plays the boss a new composition, which has been engineered to embody the latter's favourite musical tropes — to push his buttons, if you will. Without giving too much away, it works. The boss, called Clive in a knowing nod to a well-known industry mogul [Sean assures me no such nod was intended and any similarity to persons living or dead is entirely coincidental…], takes the bait and employs the geek to create more of these personalised sure-fire hits. Not just to create them, in fact, but to seed them virally through targeted online discussions. I felt an uncanny doubling of the impact of this scene. 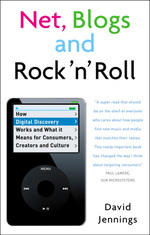 The book touches on so many of the themes that interest me, and which I wrote about in Net, Blogs and Rock'n'Roll, that I began to wonder if a very clever geek had written it for the express purpose of pushing my buttons. It had, after all, reached me via a well-targeted email from a software bot claiming to be a writer called Sean McManus, who comes complete with a convincing back story.